A simple gesture can change the way we relate to ourselves and the world. Our minds affect our bodies, but the way we carry our bodies can also change our minds. There is some fascinating research on this by Dr. Amy Cuddy, who explores how body language (eg. the way we choose to stand, hold our shoulders, lift our heads) can actually improve stress hormones, confidence levels, and ultimately our performance. we also close ourselves to joy, and vitality. And that, deep down, is really what we crave. When we learn to open our hands in the moment, in some ways we are choosing to feel everything, which is vulnerable but often so necessary. 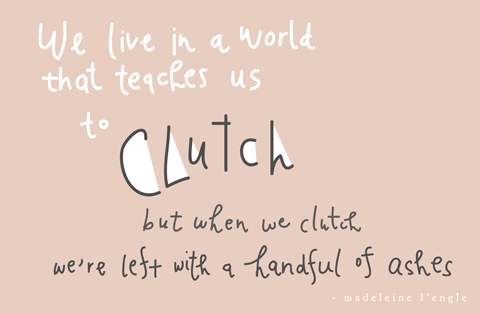 As Madeleine L'Engle said, the world teaches us to clutch (onto safety, people, opportunities, ideas, things) but more often than not, this results in more tension, heartache, and loss. 1. Right now, wherever you are sitting or standing, hold out your hands in front of you, with the palms facing up. 3. When you reach 10 counts, breathe in and then exhale, relaxing your fists. Let your hands open up slowly, until it is like you are holding a smooth little gemstone in the center of each palm. 4. Stay here for just a moment, and breathe. Now, what was it like to hold your hands open? You can feel what openhandedness is from the difference. In a world that teaches us to clutch, if we choose to let go, give freely -- stay openhanded -- then we make space to simply receive. Sometimes, literally opening up our hands is a good reminder of this. If you try this exercise, I would love to hear your thoughts! This post on Openhandedness was made for this week's InspirationRx, but has been one of my personal themes this year -- see my post on The Pie. So soft yet so powerful!